This is not what a Bosc Monitor looks like. 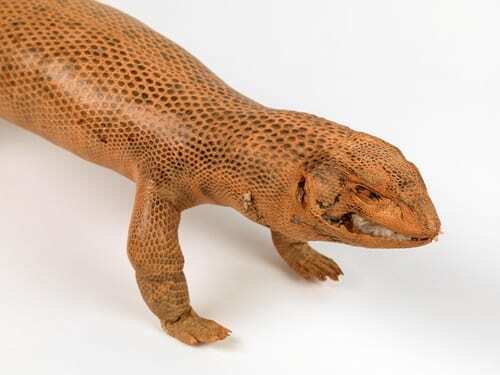 That’s the trouble with taxidermy: it can be very inaccurate, which is interesting if you think about it, as it is at once a “real” lizard specimen – made of the lizard itself – but also inauthentic. There are many taxidermy specimens in museums that do not accurately depict the animal they are representing, but museums rarely acknowledge this, which means we are constantly misleading our visitors. I plan to explore this further in a future post. Anyone can make art, but that doesn’t make them an artist. Good taxidermy is art. Good taxidermists are artists. Whoever prepared this lizard was not an artist – as you can see. It is awful. Look at it. It is awful. This specimen came into the Museum in 1982, as part of a large batch of material that had been seized by HM Customs at UK airports from people who were illegaly attempting to import protected species (this one came from Nigeria). Customs then donated them to the Museum to be used for educational purposes. Trade in animal specimens is a significant factor in biodiversity decline globally, and while there are organised crime groups exploiting wildlife on an industrial scale, it’s more likely that the person who tried to import this lizard had naively bought a souvenir on their holiday, and were unaware of the impact of their actions. The lesson is don’t buy souvenirs that incorporate wildlife products, even ones which are so awful that they are charming – you don’t know what harm you could be doing. 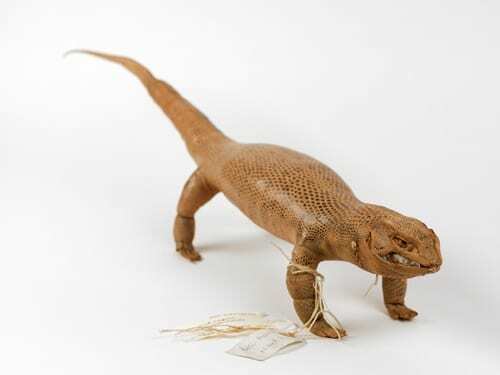 While Bosc monitors are not considered endangered (but all monitor lizards are protected under CITES), we have two of these specimens at the Grant Museum, and I have seen an identical one at Manchester Museum (prepared in the same way). It would seem likely that they were made by the same person, who was trading in this species regularly, which is bad news for monitor lizards. *The video is part of an excellent installation by ethical taxidermist Jazmine Miles-Long which closed this week, but the website is worth a visit to learn more. Natural history has always been cool – don’t need hipsters to tell us that!